Canada's West Coast, including Vancouver, enjoys a rather different climate than the rest of the country, so weather in Vancouver is hardly comparable to other popular Canadian destinations, like, say, Toronto or Montreal. Vancouver is easily the warmest of Canada's major metropolitan centers. Even in winter, Vancouver rarely gets snow or temperatures below freezing. The downside? Rain, especially in winter. Vancouver's foggy, wet weather begins to take grip in October, peaks December through March and starts to taper off in April. From October to March, it rains twice as much as it does from April to September in Vancouver. So, there's that. Nevertheless, Vancouver residents are a hearty group and a little rain does not dampen their lust for the outdoors. Part of the city's charm is the laid back people who live there and their resilience to crummy weather (helped in part by the proper clothing). There's also an abundance of rainy day activities to enjoy in the city. If you are prepared to put up with some precipitation, then October is a great month to travel to Vancouver. If you think rain would be a major blight on your ability to have a good time, then summer may be your better choice. But if you don't mind a sprinkling of rain or some gray days then the fall is an ideal time to see the city without the summer crowds. Allan Fotheringham once called Vancouver the Canadian city with the best climate and the worst weather. 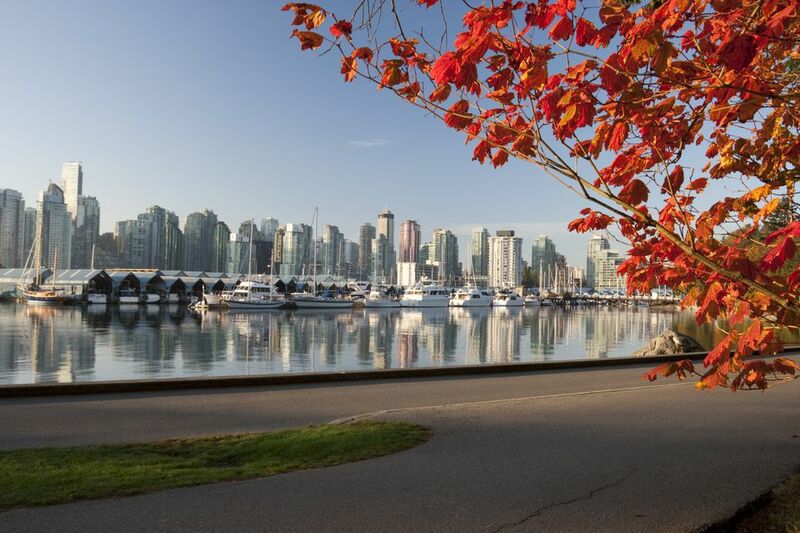 October, much like September, has the potential to show visitors great Vancouver weather - mild and clear; however, dull and grey is another possibility. The average October temperature is 10ºC / 50ºF with an October average high of 14ºC / 57ºF and an October average low of 6ºC / 43ºF. It rains about half the days in the month of October. Humidity is fairly low thanks to ocean breezes and on occasional sunny days in early October the ocean might be warm enough for brave swimmers but generally, it's a chilly 10ºC / 50ºF in the ocean at that time of year. Layer up for an October vacation in Vancouver as you'll want to stay dry and comfortable. While the climate is relatively mild compared to the rest of Canada, you'll definitely want to pack wisely. There's no such thing as bad weather in Vancouver, just bad clothing choices. Vancouverites are notoriously casual dressers and you don't need to bring formal wear, even for high-end restaurants. Most residents wander around in workout gear, even if they are not going anywhere near a gym or yoga studio. Warm, waterproof clothing; sweaters, hoodies, light jackets, heavier jacket; closed-toe shoes; boots if heading out of the city. Vancouver residents dress casually and weather appropriate, which often means comfortable shoes and rain resistant wear. October is a magical time in Vancouver with the end of summer giving way to fall foliage and autumn celebrations, such as pumpkin patches, corn mazes and more. Okanagan Fall Wine Festival: The Okanagan Valley is 312 miles east of Vancouver (about a four to five- hour drive) or 125 miles north of the U.S. border in Washington State; it is one of Canada's biggest wine-producing areas. West Coast Chocolate Festival, Coquitlam BC (about 30 mins from downtown Vancouver). Fewer tourists mean travel bargains through airlines and hotels. The second Monday of October is Thanksgiving in Canada. Banks and most stores will be closed. Expect crowds that weekend. All of Canada celebrates Halloween on October 31. Kids trick or treat and costume parties abound. If you would like to escape Vancouver's rain, here is a list of museums, libraries, and other indoor venues where you can stay dry: Top 10 Things To Do in Vancouver on a Rainy Day. Weather conditions can be quite different even just half an hour away. Maybe you want to get out of town on a rainy day. The surrounding region is full of interest and natural beauty: The 12 Best Vancouver Day Trips.